Easy Come, Easy Go…Does Not Apply Within the Diet World! I texted an accountability update to my sister before church recently. With ten more pounds to lose, I’m still pleased with my current weight of 145 pounds. Cindy constantly makes me laugh, so I thought I’d pass a smile onto you. The screenshots of our conversation are quite comical, but they certainly ring true for most of us. Her spontaneous ending remark is credited with renaming this blog post. When Every Woman Blog published my post, “New Year…New You…No Dieting,” a couple of months ago, a coworker and sweet friend shared it with others. What Neya didn’t share was that she implemented this plan for herself. She was a sneaky secret keeper—until she couldn’t hide it any longer. A few weeks into the new year, I noticed she was losing weight. Unbeknownst to me, she was following some of the tidbits of advice I gave in my first blog post of 2019. She chose the “My Net Diary” app instead of “Lose It.” We are having a ton of fun on our journey so far, but when our calorie intake exceeds our limit, we agree it is detrimental to our psyche. Nothing can be done once the choice has been made to eat the burger, fries, chocolate cake—or all three. Other than laughing about it, our secret is moving on and making better choices the remainder of the day. Neya is a beautiful new mom. After sweet baby Mason was born, she weighed in at 234 pounds. Having lost twelve pounds since the first of the year, she currently weighs in at 222 pounds. For every good weight loss plan, there is an exercise program to match. Being young and vibrant, Neya is signing up for a gym membership. I’m so proud of her for taking steps to improve her mental and physical well-being. A healthy mama is a happy mama. Regrettably, I approach exercise from a different angle. In the past, I always enjoyed a challenging workout, but now shudder at the thought of it. Rheumatoid arthritis and similar illnesses take a toll on the human body. Exhaustion and pain typically rule the day. My pain levels are now mostly tolerable, but I cannot subject my joints to workouts I accomplished in the past. Since daylight savings time has ended, my plan is to simply enjoy an evening walk in my neighborhood at least three times a week. It’s not as easy as it used to be, but I resolve losing the last ten pesky pounds one small step at at time. Doing something is better than nothing at all. I will update you on our journey in a future post. Hopefully, we will be reporting positive results. How are your health and wellness goals? Do you need a fresh start? There’s no shame if you do. It’s never a “one size fits all” situation. Simply do what’s best for you! Refocus, rebalance, restart—because you’re worth it! I recently looked back at my weight over the past two years. Except for the initial weight gain when I returned from Shepherd Center, I’ve generally I’ve stayed about the same. I felt a little crazy. Despite all of food tracking and measuring, exercising and gym visits, obsessing over ever calorie and measuring food, I was about the same weight. Whaaat? Around that time, I saw a book called Body Kindness in one of my social feeds. The book promised to “show you how to create a healthier and happier life by treating yourself with compassion rather than shame.” Life is too short to be at war with my body, I thought as I ordered it. If I’m not going to benefit from “dieting” and assigning myself a goal weight, I may as well enjoy food and quit worrying so much. The part of the book that resonated with me was “firing the food police” and seeing food as neutral, declassifying foods as “good” or “bad.” I gave up recording in My Fitness Pal (MFP), bought foods I haven’t eaten in years and had a lot of ice cream. But food freedom didn’t automatically transfer into more mindful eating, an indifference to “problem foods” or weight loss. When I finally weighed myself after a few weeks, I was up a couple of pounds. That isn’t the end of the world, I know, but if you’re short and already have a few extra lbs., it’s a good warning sign. Despite my tendency to overeat using the Body Kindness concept, I did love the “Body Kindness” tips. I loved striking morning power poses in the mirror; getting more sleep and practicing more positive body self-talk. I loved feeling less conscious and more empowered. It didn’t lead to weight loss or even maintenance, but it felt good. I’ve decided that for me, meal planning and food journaling worked; it’s empowering and energizing. I’ve returned to food journaling and my goal to eat healthier. But I also decided to continue incorporating those body kindness tips as I worked toward getting closer to my goal weight. Until then, I was stuck with a few extra pounds on top of what I wanted to lose before. For inspiration, I visited MFP’s website, where I found these tips to get back on track from MyFitnessPal’s blog. Stop saying “I’ll start over tomorrow.” Instead of me focusing on the 22 total pounds I want to lose, I’m going to start with the five pounds I can realistically lose in one month. And I’m not going to obsess over working out for an hour every day of the week, when a nice walk outside for 20-30 minutes will be a good start. It’s easy to feel ashamed, guilty and embarrassed when you gain or regain weight. Weight gain happens, so I’m going to shift my focus from the past and set my sights on concrete actions I can take to move forward. I’m going to set attainable goals and celebrate when I hit them – striving for progress, not perfection. Whether it’s a personal trainer, nutritionist, medical doctor or therapist, it can help to have someone holding you accountable. I love my trainer, and he keeps me honest. My body is still recovering from the time I spent in bed during my rehabilitation, and my frozen vocal cord prevents me from doing too strenuous a workout. Cash helps me determine what exercises are off limits for the moment and ways I can modify others for the long term. He also knows me well enough to know when to push me a little, too. It’s always helpful to plan out your meals to prevent you from falling back into old bad habits like eating ice cream every day. I started by jumping forward one day in My Fitness Pal and plugging foods into each meal ahead of time. Taking the time to think it out helps, and once I’ve journaled it, the “getting ahead” is more likely to keep me honest than fleeting good intentions in my head. Tell your circle of influence that you’re working on healthy eating. They may want to join you, and everybody knows that it’s easier when you have a fitness/food buddy. They can help by keeping junk food out of sight or not tempting you with unhealthy food in the first place. It’s only been a few days since I shifted my mindset, so I haven’t magically lost that weight I gained. I’m eventually going to weigh myself again, and I haven’t lost sight of my goal. Instead I’m going to judge my success by how I feel and how my clothes fit. Weight gain happens and weight loss is hard work, so I won’t give up or feel defeated if I struggle. I’ve got this, and I’m not alone. Have you ever looked up and suddenly gained more weight than you anticipated? What was your wakeup call? What did you do? And what are your tips for staying on track? I’d love to hear from you. Sunday, I woke up tired, groggy from pain meds and in some discomfort from the angiogram I had earlier in the week. I had a million things I wanted to do, but decided to rest and have a low key day. I pulled out a legal pad, and the next thing I knew, I was re-writing the profile on my “My Fitness Pal” food log and fitness app. I’ve resisted updating this profile, but it’s time for a fresh start. It’s been a crazy 19 months, to say the least. The more I wrote, the more I wanted to write, and soon it came together as this blog post. Thankfully, I suffered no permanent deficits, but my vocal cords were damaged during intubation, which has impacted both my voice and my breathing. Both are being treated and may get better, but for now my workouts are limited due to my constrained airway. Since around January, 2016, I’ve been doing light strength training with cardio on the NuStep and/or treadmill at a local gym. I’m definitely building strength, especially noticeable over the last few weeks, but I can’t do the hour on the treadmill or elliptical like I used to do. With today’s weigh in, I’m officially up about 11.3 lbs. from the day I had the rupture. It doesn’t sound like much, but with my inability to exercise at the same intensity, it looks and feels like five times that amount. To add insult to injury, most of the changes have occurred between my waist and knees. I feel embarrassed, ashamed and worst of all, like an overweight short-haired-blonde Wonder Woman. Today, I’m taking steps to make peace with myself and get a fresh start. My weight is up, and I look and feel much different, but that doesn’t take anything away from my miraculous recovery and my gratitude for surviving. I am where I am, and I’m thankful to be here. My body has been through a significant trauma, and if it took a weight gain to survive, that’s okay. If given the choice, I would’ve easily opted for the weight gain over dying. But because I do now appreciate life so much more, I’d like to lose some weight so I can enjoy it more fully and freely. My journey starts now. I’ve set a goal of 22 lbs. to keep myself honest, but it’s less about the number and more about the way I feel. Here’s to a fresh start and the beginning of a new chapter in my recovery. One of the issues with Bipolar Disorder and the medications I have to take is that I tend to forget things. I have alarms for everything: to remind me to take my medications, to get my son off of the bus, to wake up, to go to bed, and the list goes on. Yet even with these reminders I still manage to miss a thing or two. It is very frustrating. So I always try to keep my posts honest and relevant to my ordinary life, which is why I share things like the following. I am starting a weight loss journey. I went to see my primary care doctor and she suggested a meal plan and exercise routine, but after 3 weeks I have not been able to keep it going. I need accountability on a regular basis and someone to cheer me on. So I am joining the Livestrong program at my local Y, which gives cancer survivors 24 free classes beginning this month. I am also thinking very hard about re-joining Jenny Craig as I did have success with that program in the past. I became concerned (way overdue) during a recent hospital stay when I actually saw the number on the scale. Let’s just say being breathless all the time makes sense when you are carrying another person around. Lexington Medical Center is pleased to announce it’s now the title sponsor of the Heart & Sole Women’s Five Miler, which is set for Saturday, April 25 in downtown Columbia. 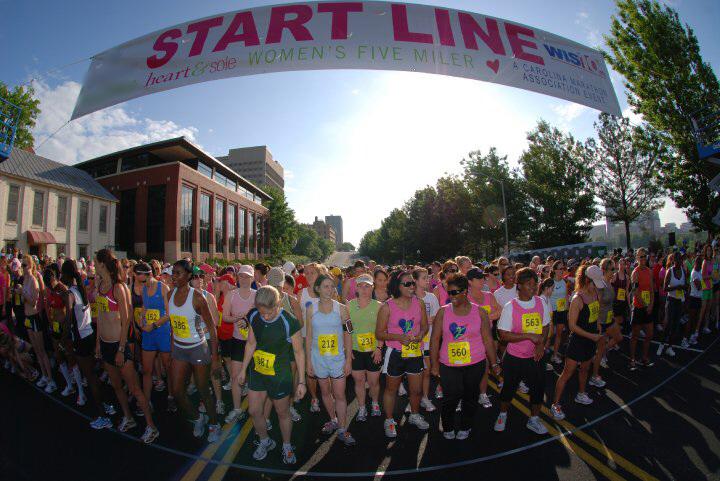 As South Carolina’s premier all-women road race, Heart & Sole includes a five-mile run, and three- and five-mile walks. For the past 14 years, the event has encouraged healthy lifestyles through physical activity and called attention to the issue of heart disease as the #1 killer of women. More than 2,000 women participated last year. With a personal and supportive environment, the course begins near Finlay Park at Laurel Street, and winds through the Vista and the University of South Carolina campus before ending on the Taylor Street side of Finlay Park. This year’s event will begin with an opening ceremony at 8:00 a.m. featuring news anchors from WIS-TV, the co-sponsor. The five-mile race begins at 8:30 and the walk at 8:35 a.m. Top runners will receive cash prizes. After the race, participants will enjoy special refreshments, entertainment and an expo featuring health screenings and local vendors. We know you’ve got heart. And we know you’ve got soul. So, join us on April 25! We’ll see you at the start line! Registration is only available online. For group of 7 or more people, registration is $23 before March 20. There will be no group registration after March 20. Follow Every Woman Bloggers, Sherree Thompson and Crissie Kirby, who are training for Heart & Sole here from now until race day! 2015: New Year, New You? Often when people make a New Year’s Resolution they resolve to change something big or to do something great, better, or more. While everyone’s resolutions are genuine and meant to be helpful to either self or community, a resolution to do something big such as run a marathon, do a triathlon, walk 10,000 steps a day, or the #1 resolution – to Lose Weight or Be Healthier – often ends up unachieved. What starts out with so much enthusiasm at the beginning of the year generally fades by February or March. We see it all the time; the health clubs are crowded so you wait in line for the treadmill or stationary bike and the exercise classes are full. Unfortunately by February and (definitely by March) the health club is almost empty. Why do we see this? What happened? Did everyone just give up on all those resolutions? Did they decide losing weight or being healthier isn’t important? Of course not! They likely forgot the definition of resolution: “The act of analyzing a complex notion into simpler ones”. We have to be SMART about our resolutions in order to achieve them. Like everything we do, there are steps to achievement. Eat more vegetables and/or fruit? “I will switch my chips at lunch for vegetables”. Attainable: Think small – one change at a time. Work on one meal at a time, one day at a time. Making more than one change every 3-4 days can become overwhelming which can lead to all good intentions being abandoned. Time Bound: Set a firm time limit to achieve a goal and gauge your progress. For instance, consider making one change a week. You could keep a food log for one week to check your progress. When you have accomplished the initial goal then set a new goal to build on the one you have accomplished. Changing one’s lifestyle is a journey and must be treated like a long term adventure. Breaking down a goal into manageable parts makes it easier to see progress and stay motivated. It also allows to adjustments when necessary. 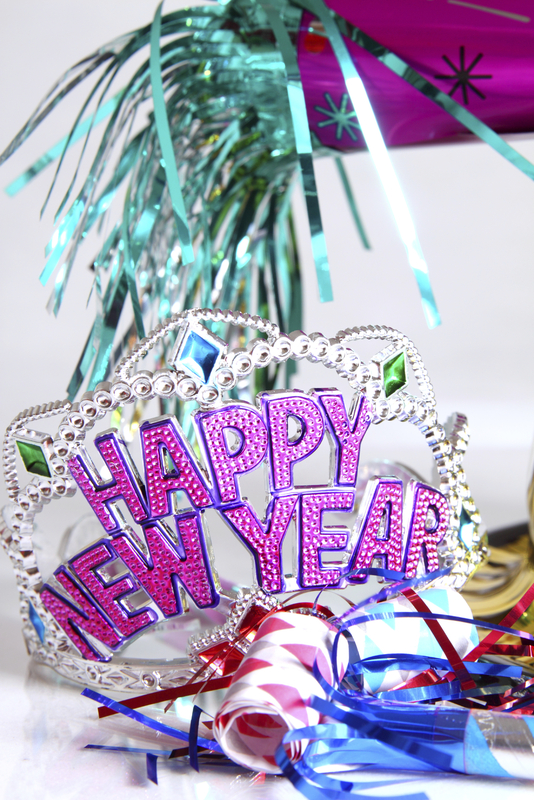 Be SMART and have a Happy New Year! If you are interested in having help with your healthy nutrition goals, contact Laura Stepp, Outpatient Dietitian, at 936-4132. No one buys a Pumpkin Spice Latte thinking it’s a healthy drink, but YIKES! More than one of those could derail even the healthiest eater! 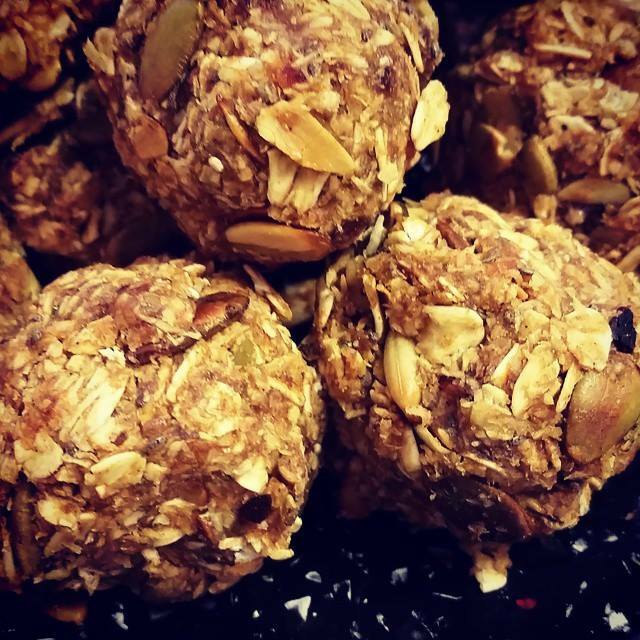 Pumpkin No-Bake Energy Bites: I first tried these over Labor Day weekend, and they’re wonderful! They’re a great on-the-run snack and/or pre/post-workout treat. Pumpkin Spice Smoothies: Compared to the same size Pumpkin Spice Latte, it has half the calories and sugar, a third less carbohydrates and even a nice amount of fiber! And it’s cold and extra refreshing during those still-warm September days. What’s your favorite fall food? Do you have a healthier version or do you just splurge during the season?